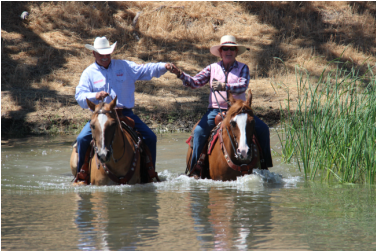 We look forward to hosting our 5th "RIDE THE RANCHO - A True Horsemanship Experience" event! 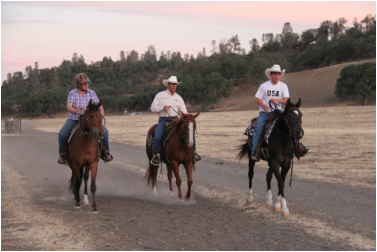 ​Our fifth "Ride The Rancho" event will help each rider expand and improve their horsemanship in a myriad of practical and fun scenarios in and out of the arena. We're going to take advantage of this beautiful 20,000 acre cattle ranch and explore some of the hidden areas of the V6 that oftentimes visitors never see. You will continue to learn and grow from Richard's solid horsemanship techniques and support. You'll be challenged and excited about the format and feel for this 2019 "Ride The Rancho." As always, arena time, big country riding, real life obstacle course and cattle working will all be a big part of our week together. Those who would like to join us for a short Cowboy Church are certainly welcome! This event allows you 5 full riding days. Daily hands on instruction from Richard Winters! Richard enjoys all of his meals with the participants enabling him to be available for questions and visiting throughout the week. "I am very impressed with how you, Cheryl and Richard, keep everything organized, are respectful and welcoming to all and most importantly, the way you respect each other. Thank you for a great week!!!" "​I heard this mentions multiple times: I feel SAFE when riding with Richard!" "I like that horse and rider are exposed to many different situations, which helps to reveal problem areas." 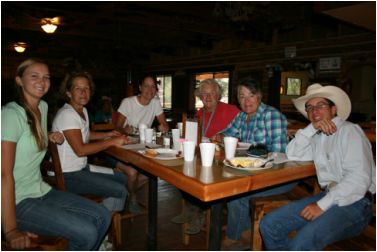 "This is truly the best equestrian vacation one can take with their horse, to do a wide variety of fun equestrian activities under the enthusiastic and very patient instruction of Richard Winters and the extraordinary facilities at the V6 Ranch and all of Cheryl's very thoughtful and gracious hospitality. Thank you for taking such fantastic pictures that truly captured so many special moments!" ​"Richard is a natural born teacher - he is so patient and makes learning fun. Loved the entire week! Can't wait till next year!" "​I feel like one of the family now. That's a good thing." "Our group was so positive and encouraging. I look forward to sharing the trail with you again!" "Thirty years of tying horses and in the first ten minutes of a Richard Winters clinic I learned a better way. Weeks of struggling with getting a correct right lead and ten seconds with Sarah, got it done. Why didn't I discover Richard sooner?" "I had seen the Richard Winters Horsemanship program on RFD-TV and was very impressed with Richards' ability to clearly communicate his ideas to his audience. True to his tv program, he was even better in person. With such a mixture of riding ability, age and discipline, he was able to offer something for everyone attending the clinic. After a full week of nothing but "horse", I certainly have come away from this clinic with a better understanding of my horse and have gained the much needed confidence in my ability to communicate and handle him." "Richard, Your teaching is filled with these life~changing adages. Your instruction has opened my horsewoman possibilities: I can become a better partner/rider for my horses. Thank you for the lessons and your patience in repeating the key messages, such as "making the right thing easy" and "closing 5 of the 6 doors..." You and Cheryl are inspirational as business partners, as married couple, and as Christians." "Cheryl, you play such an intricate part of the Horsemanship Program – believe me, we know how much work it takes behind the scenes to make a program like this come together so successfully! And, your warm and friendly personality made us feel so welcome. What a surprise and special touch you added with the gift for the 3 cancer survivors! You two will be in our prayers for continued success in sharing “horsemanship and the Word of God" throughout the years to come.